On Friday morning, 28 December, off-duty soldiers Cpl. Ahikam Amihai and Sgt. David Rubin were hiking in wadi Telem with a female companion when four Palestinian terrorists opened fire on them from a jeep. . . . 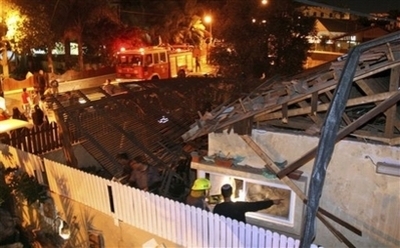 The families live in neighboring apartment buildings in Kiryat Arba. Both boys studied at the Mekor Haim high school yeshiva in Kfar Etzion and volunteered for elite IDF units. Ahikam was the fifth child of Rabbi Yehuda Amihai and his wife Esther, and a grandson of Rabbi Tzvi Neria, "father of the knitted scullcap generation." Rabbi Yehuda Amihai is head of the Torah and Land Institute, formerly in Kfar Darom in the Gaza Strip. David was the eldest son of Rabbi Mishael Rubin, rabbi of Hebron's Shavei Hebron yeshiva. 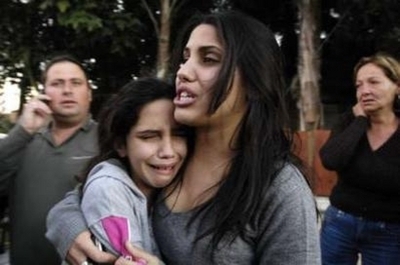 BtB has a heart-breaking report on the funerals. 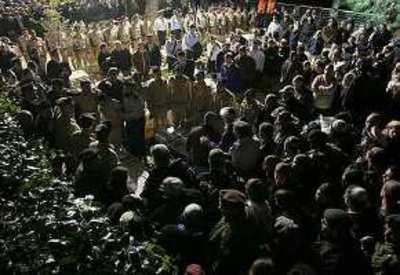 The top Palestinian security official said on Saturday his government was dismantling militant groups, including those connected to President Mahmoud Abbas' Fatah faction. . . .
"There is no Al-Aqsa Martyrs Brigades any more," Interior Minister Abdel-Razak al-Yahya told Voice of Palestine radio, referring to Fatah's largest armed group. . . . But the diplomats questioned the government's ability to disarm Fatah militants on a larger scale, noting Al-Aqsa's decentralized command and control structure. Some of the gunmen who participated in Friday's shooting attack near Hebron belong to Palestinian Authority President Mahmoud Abbas's Fatah faction, Fatah activists in the West Bank confirmed over the weekend. They said the attack was carried out jointly by Fatah and Islamic Jihad members. . . .
On Saturday, the IDF arrested a number of Fatah activists belonging to the Yasser Arafat Groups in Hebron on suspicion of involvement in the killing of the two IDF [off duty] soldiers on Friday. . . .
[B]oth [PA Prime Minister] Fayad and [PA Information Minister] Malki are well aware of the fact that the PA's plan to dismantle all the Fatah-affiliated militias in the West Bank is still far from achieving its goal. Fatah's armed wing, the Aksa Martyrs Brigades, on Sunday called for the murder of Palestinian Authority Prime Minister Salaam Fayad for "collaboration" with Israel and the US. . . .
"We call on all our members and the policemen in the West Bank not to obey orders from the Fayad government, because it's serving an American agenda and helping Israel eliminate the Aksa Martyrs Brigades," the group continued. It also called to fire PA Interior Minister Abdel Razzak al-Yahya for announcing that the Aksa Martyrs Brigades in the West Bank had been dismantled. . . . The Aksa Martyrs Brigades appears to be still around, even after being "dismantled."
. . . one of the terrorists who killed two Israeli hikers on Friday near Hebron is a policeman in the Palestinian National Security Force, and the other is a known Fatah operative and a close associate of the Palestinian Intelligence Service, the Shin Bet (Israel Security Service) revealed Tuesday night. According to details of the murder of off-duty soldiers and nature enthusiasts David Rubin and Ahikam Amihai, the gunmen, Ali Dandis, 24, and Amar Taha, 26, surrendered on the day of the attack to the Palestinian security forces in Hebron out of fear that they would be caught by the IDF. They also handed over the weapons they captured from the hikers. . . .
[Israeli security officials] noted that Friday's attack was not the first time that Palestinian security officials or policemen were involved in terror attacks. Last month, Ido Zoldan was gunned down in the West Bank by Palestinian terrorists that turned out to be members of the PA security forces. The PA did not report the surrendering of the terrorists, the Shin Bet said. After learning of their surrender, the security agency transferred a request to the PA asking that they transfer to Israel the murder weapons and the weapons of those who were murdered. In Palestinian parlance, when a terrorist is "dismantled," it means he has turned in his gun, joined the PA "security forces," and been given a gun. Then a press release is issued. 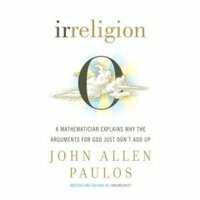 IN THE MAIL: John Allen Paulos, “Irreligion: A Mathematician Explains Why the Arguments for God Just Don’t Add Up” (Farrar, Straus and Giroux). Paulos is the author of the best-selling “Innumeracy: Mathematical Illiteracy and Its Consequences,” and his new book seeks to add to the already burgeoning neo-atheist best-seller list. At the risk of being a bit cloying, I remember another early indicator of my adult psychology. I was scuffling with my brother when I was about ten and had an epiphany that the stuff of our two heads wasn’t different in kind from the stuff of the rough rug on which I’d just burned my elbow or the stuff of the chair on which he’d just banged his shoulder. The realization that everything was ultimately made out of the same matter, that there was no essential difference between the material compositions of me and not-me, was clean, clear and bracing. Paulos considers his adolescent insight precocious, but his passage inadvertently demonstrates the inherent limitation of a purely materialistic or mathematical view of life. It lacks a soul. When the scientist looks at eating, what does he see? An objective fellow, he sees coolly from the outside. Generally speaking he sees animal movements to gain food, the movement of edible material from the outside in and down, the physical and chemical breakdown of food, the energetics of the process, and the maintenance of a steady internal environment of sugar, nitrogen, salts, and the like. More specifically the anatomist may show how the powerful masseter muscles at the angles of the mouth cause the lower jaw to move, enabling the teeth to grind the ingested food, or how the tongue and the pharyngeal muscles are coordinated with each other and with the closure of the epiglottis to ensure the successful act of swallowing without aspiration into the lungs. The physiocologist can show how the sight of food stimulates the psychic phase of gastric secretion through the vagus nerve or how rise in blood glucose after a meal releases insulin from the pancreas to facilitate the transport of sugar into the cells. The biochemist studies how sugar is oxidized and its energy trapped by the process of oxidative phosphorization or how stores of glycogen in the liver are released during a period of fasting. The molecular biologist can demonstrate how a certain genetic mutation produces the inborn metabolic disease phenylketonuria (PKU) or how the supply of mesanger – RNA – is regulated to increase the desired protein synthesis. The psychologist will show how certain stimuli ordinarily presented with food can come on their own to induce salivation or how certain childhood traumas give rise to special food aversion or to eating disorders. And the anthropologist will study how different cultures eat different foods, in different manners, and with different rituals. And anatomy, physiology, biochemistry, molecular biology, psychology, and anthropology -- even taken together -- cannot produce the transformative understanding contained in a simple prayer before a meal. Perhaps it is because they describe only the visible world, where everything may appear to be just stuff. There are a lot of nice blurbs on Paulos’s book. Sam Harris found it “elegant and timely.” Michael Shermer found it “penetrating.” I found it consistently cloying. The high quality video was produced by Jewish TV Network. Allow about 10 seconds for it to load and another 10 seconds for the sound to begin. It will be worth the wait. (See also JCI, “Science, Religion and the New Atheism;” Damon Linker, “Atheism’s Wrong Turn;” David Klinghoffer, “The Human Factor;” Ross Douthat, "Lord Have Mercy;" and especially Preston Jones, "Christopher Hitchens Explains It All For You"). UPDATES: See also Anne Lieberman's lovely post "Me and Not-Me" at BtB. Steve Padilla’s column in The Los Angeles Times reported on his “night with the atheist and the rabbi” at American Jewish University. John Allen Paulos’s comment on this post is below. Kyle-Anne Shiver has a smart and perceptive article in today’s American Thinker that profiles Carolyn Blashek and Operation Gratitude (the article has a comment thread at Lucianne) and puts the phenomenon into an even broader social and political context. Back in April 2003, Blashek started sending letters and packages to the troops in Iraq, working out of her living room. "To me, it's worse right now than ever for those troops. The soldiers are hanging around now, and the danger is just as high. But nobody's thinking about them anymore because we won. They need us now more than ever." By June 2005, Operation Gratitude had shipped an incredible 63,984 packages, as it grew and grew (the story of how it grew is the second of two inter-related “Two Tales of Tikkun Olam”). 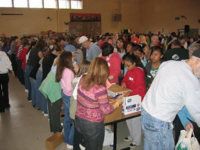 By December of 2006, the number exceeded 200,000, and thousands of volunteers were involved. Currently, the figure is 314,786. The packing and shipping is continuing this Thursday-Sunday at the National Guard Amory in Encino. You can volunteer by emailing CBlashek@aol.com. Children 12 and older are welcome. When all the Christmas presents to thousands of soldiers in Iraq and Afghanistan were wrapped, labeled and mailed, the San Fernando Valley's No. 1 Santa Claus did what she always does when another month-long Operation Gratitude holiday drive ends. “You're so worn out, so physically and emotionally spent that you don't think you can do it anymore,” Carolyn Blashek says. “Then you open your mailbox or receive an e-mail, and there it is again -- another little miracle.” . . . I wrote about one of those little miracles Blashek is talking about for the USA Weekend Magazine edition Sunday, but because of space limitations I couldn't tell the whole story. It was from a staff sergeant who asked that his name and unit and the soldier's name not be used because he didn't want the soldier "labeled" by his superiors. . . . The soldier in his platoon never got mail, care packages or anything from home, the sergeant wrote. He was estranged from his family and the only packages he got were labeled "to any service person." . . .
“He was planning suicide on Christmas” . . . What changed his mind, his superiors wanted to know? 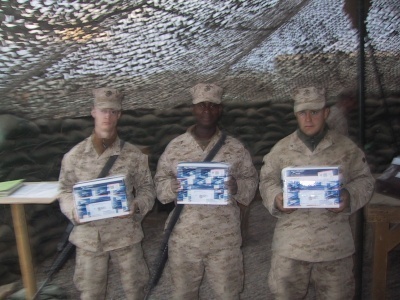 The soldier told them he came back to his barracks alone on Christmas Eve (last year) and saw a package on his bunk. He picked it up expecting to see the label "to any service person" on it. Instead, he saw his name staring back at him. He opened the package and read the letters from kids addressed to him, and he began to cry. Over the next month, the soldier sought counseling and reached out to his family back home to reconcile their differences. "Over my deployments I have lost a few soldiers in the platoons I have taken into combat," the sergeant wrote Blashek. "I have lost a few friends that I have known my entire Army career. . . . "I don't know if I would have the strength, or even what to say to the family of a soldier who had taken his own life. "But one package, one present from you containing some little things and a few letters from kids made a huge impact in a human's life. . . . "You've let an old sergeant bring one more of his soldiers back home safely, and for that I am forever in your debt." Little miracles on Christmas Day. One of 314,786. And counting. QUESTION: . . . there is some smart money that holds that basically, the President and the Secretary of State are going to countenance the declaration of some kind of Palestinian state before they leave office just as something they can hang their legacy hat on and if it looks very much like the Palestinian state that we have right now, that's for their successors to deal with. Can you disabuse us of that? Notice that Rice’s answer (quoted above in its entirety) did not take the opportunity to disabuse the smart money prediction. Instead, the answer was another of Rice’s increasingly self-congratulatory assertions that the process in which she is currently engaged -- leaning on the weakest leaders in Israeli history -- is just so darn hard. (1) organizing an international coalition to disarm Iran, (2) stopping the genocide in Sudan, (3) dismantling the North Korean nuclear program, (4) removing Syria and Hezbollah from Lebanon, (5) standing up to an increasingly aggressive Russia, (6) confronting rampant abuses at the UN, and (7) informing the Palestinians that, if they cannot pledge recognition of a Jewish state, there is no point in further discussions (or further funds). Any of those issues (except number seven) would be tough. She gets no “degree of difficulty” points for pressuring the inexperienced and overmatched Ehud Olmert and Tzipi Livni to waive conditions for final status negotiations promised to Ariel Sharon in the U.S. letter of April 14, 2004. I think that it's important that a variety of people in Israel hear first hand from the United States, from me representing the President, how important we see the establishment of a Palestinian state to be, how important we see it to be because frankly it's time for the establishment of a Palestinian state . . . . It's time for Palestinians to have their own state. We've -- everybody's waited a long time and so the United States feels strongly that this is the time to make a very big effort. It’s important, important, important, because it’s time. It’s time because everybody’s waited a long time. The U.S. feels -- strongly -- that this is the time. As an explication of American foreign policy, this is not just absurd but embarrassing. On the eve of the Hamas takeover of Gaza, the PA was no longer able (and in some respects, it never was able) to fulfill the most important functions of a state: to provide for the welfare and security of its people. The clearest signs of the weakness of the PA were what Palestinians referred to as “the four Fs”: fawda (chaos), fitna (strife), falatan (lawlessness), and fassad (corruption). None of the four “Fs” were caused by Israel. Ending the chaos, strife, lawlessness, and corruption that have characterized life in much of the West Bank will require far-reaching political reforms, the inculcation of a culture of political compromise, and strong leadership -- conditions not likely to be fulfilled soon. Likewise, Israeli security restrictions in the West Bank that hamstring the Palestinian economy, limit Palestinian freedom of movement, and constrain the PA’s ability to exercise its authority throughout the territory are likely to remain in place until Fatah’s militia, the al-Aqsa Martyrs Brigades, is dismantled and the PA demonstrates that it can prevent attacks on Israeli civilian and military targets and check Hamas’s efforts to lay the groundwork for a future takeover in the West Bank. Next month the president is heading to Ramallah, when he should be going to Sderot. 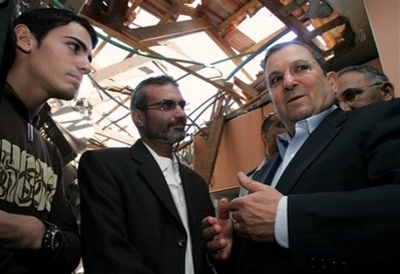 Israeli Defense Minister Ehud Barak, right, looks on during his visit of a house destroyed by a Kassam rocket last week, in the southern Israeli town of Sderot, Monday, Dec. 17, 2007. (AP Photo/Edi Israel/pool). Is there any empirical evidence to suggest that relinquishing land might buy Israel some form of peace? Here we are, two and a half years after the immeasurably painful disengagement from Gaza, and what has been the result of that noble sacrifice for peace? Hardly a day – hardly an eighth of a day to be precise – goes by without Israelis in the town of Sderot being terrorized by the constant barrage of Kassam missiles. Earlier Scenes from Sderot are here. The Prime Minister's Office has established a task force dedicated only to preparing for U.S. President George Bush's visit. . . .
“So many bodies are involved in this visit and there needs to be coordination between all of them, so a task force was set up,” a source in Olmert's bureau said Tuesday. At least 8,000 police officers will provide security for the visit. An official ceremony will be held at Ben-Gurion International Airport, with VIPs welcoming the U.S. president. . . . Following the ceremony, Bush will head to Jerusalem with President Shimon Peres and Prime Minister Ehud Olmert. And then he will be less than a two-hour drive from an historic opportunity. The first-term George W. Bush, with his Kennedy-esque Acceptance Speech, would have done it in a minute. The George W. Bush who gave a Kennedy-esque Second Inaugural Address would have done it as well. If he were to do it now, it would light a fire in the minds of men. See “Following Kennedy’s Lead” in today’s New York Sun. The panel featured Dennis Prager, John Podhoretz and Mona Charen, moderated by Michael Medved. The hour-and-a-half video is here (it takes about 30 seconds to load). It is worth watching in its entirety. MEDVED: What is the best response for people who say that there is a contradiction between American patriotism and love for Israel? PODHORETZ: American patriotism and love for Israel stem from the same root -- which is a love of freedom, religious freedom, and the freedom that comes from the root and core and basis and fundament of Western Civilization -- which is the notion that all men and women are equal in God’s eyes. That was the radical underpinning, the basis, the forefront, the animating purpose of Judaism; it is the lesson and the heart and soul of all of the best that the West has to offer. It is what animates the United States. It is what gives it a universalist message. It is what has allowed us to achieve the bounty and the precious freedom that we have, and the wealth, and the free expression -- and what has allowed the nation of Israel to take an arid desert and turn it into a lush greenery, with freedom, free expression, free practice of religion and a homeland for a people that, left to the world’s devices, would not be sitting anywhere on the face of the earth. Well, of course, the reality is that most American Christians are more avidly Zionist than most American Jews. [Applause]. And the reason they feel that way is that they recognize what John was saying; they recognize the identity of values; they recognize that Israel is a struggling democracy amid a sea of tyranny, and there is a feeling of kinship there, partly religious and most of it political. [I]n the long term, the best way to defeat an ideology of hate is with an ideology of hope. An ideology of hope is one that says we value your religion, we honor the way you worship. And in our society, you can worship any way you so choose, and that's the vision and dream for societies around the world. ON THE 7th night of Hanukkah in 1944, my father was in Auschwitz. He had been deported with his family to the Nazi extermination camp eight months earlier; by Hanukkah, only my father was still alive. That year, he kindled no Hanukkah lights. In Auschwitz, where anything and everything was punishable by death, any Jew caught practicing his religion could expect to be sent to the gas chambers, or shot on the spot. . . . So I strolled about the White House last week, gazing at the portraits of past presidents and first ladies and listening to the Marine Band play "I Have A Little Dreidel." By the light of the White House menorah, I thought about my father, and about the unimaginable distance from the hell he knew in 1944 to the place of joy and warmth where I found myself standing in 2007. I was overcome with a feeling of gratitude so intense that for a moment I was too choked up to speak. To be an American and a Jew is truly to be doubly blessed. 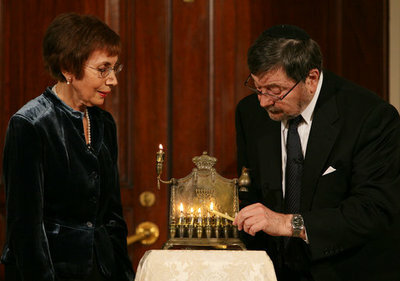 A Menorah belonging to the great-grandfather of Daniel Pearl is lit by Judea and Ruth Pearl, his parents, during festivities Monday, Dec. 10, 2007, in the Grand Foyer of the White House. Said the President of the slain journalist, "His only crime was being a Jewish American -- something Daniel Pearl would never deny . . . Daniel's memory remains close to our hearts. By honoring Daniel, we are given the opportunity to bring forth hope from the darkness of tragedy -- and that is a miracle worth celebrating during the Festival of Lights." White House photo by Joyce N. Boghosian. 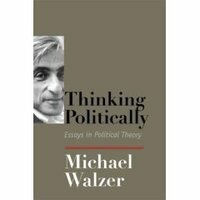 Michael Walzer, whose “Exodus and Revolution” (1986) is one of the seminal works on the influence of the Bible on liberal and radical politics, has a new collection out, covering some of his most important essays from over 50 years as a political theorist: “Thinking Politically: Essays in Political Theory” (Yale University Press). There are two very different ways of elaborating on a historical event like the exodus of Israel from Egypt. It can be made pivotal in a universal history, as if all humanity, though not present at the sea or the mountain, had at least been represented there. Or it can be made exemplary, pivotal only in a particular history, which other people can repeat – must repeat if the experience is ever to belong to them – in their own fashion. The exodus from Egypt liberates only Israel, only the people whose exodus it was, but other liberations are always possible. In this second view, there is no universal history, but rather a series of histories . . . in each of which value can be found. . . [This view can result in the following]: that we will be overwhelmed by the sheer heterogeneity of human life and surrender all belief in the relevance of our own history for anyone else. And if our history is irrelevant to them, so will theirs be to us. We retreat to inwardness and disinterest. Acknowledging difference makes for indifference. . . . We are not engaged; we have no world-historical mission; we are, if only by default, advocates of nonintervention. Call it neocons versus realists. Freedom, equality, democracy: the Declaration held these truths to be self-evident, but “self-evident” they were certainly not. Otherwise, America would hardly have been the first nation in history to be built on this foundation. Deriving all three from the Bible, theologians of Americanism understood these doctrines not as philosophical ideas but as the word of God. George W. Bush is only the latest in a long line of American presidents -- including Lincoln, Truman, Kennedy and Reagan -- who considered Americans “an almost chosen people” (in Lincoln’s phrase), living in a country whose beginning in 1776 “really had its beginning in Hebrew times” (in Truman’s phrase), that is a “shining city upon a hill” (in Reagan’s phrase) and stands ready to “bear any burden and oppose any foe” to insure the survival of liberty (in Kennedy’s phrase). All five presidents (three Republicans, two Democrats) thought America had a world-historical mission. None of them was a realist. Before you begin reading this, please have before you on screen, paper, or wall, a reliable full-scale map of the Middle East, one stretching from Morocco to Afghanistan, from the Caspian Sea to the Gulf of Aden. You will note that the territory covering 5.25 million miles belongs to states of the Arab League -- 18 independent Arab states and three part-Arab Muslim states, Mauritania, Somalia, and Djibouti. There is one holdout in that hegemony: Along the Mediterranean, south of Lebanon, east of Egypt, and west of Jordan, is the 8,000 square mile Jewish state of Israel -- the only Jewish homeland that ever was and ever will be. . . . The ratio of Arab to Jewish land is 640:1 . . . . Were I a Palestinian Arab citizen of the Hashemite Kingdom of Jordan (34,495 square miles, population 5.8 million), with its magnificent city of Petra, I would wonder why we didn’t federate with the Palestinian Arabs of the West Bank when that territory was in our possession until 1967? Why didn’t we settle our refugees as the Jews did theirs in a territory one quarter the size of ours? Since the number of Arab refugees from Israel equaled the number of refugee Jews fleeing Arab lands, why didn’t we accept this population exchange? 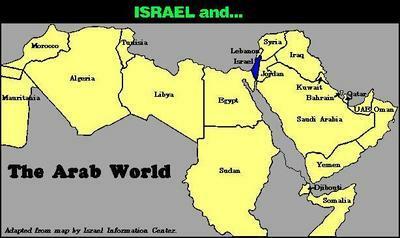 Why did we join the Arab wars on Israel with the aim of driving the Jews into the sea?
. . . I marvel at the fact that some of my colleagues apparently share the assumption that Arab and Muslim leaders are entitled to over one-tenth of the world’s land surface, while questioning the right of Jews to land about one-ninth the size of Syria. Much has changed in the Middle East during the past six decades, but one political feature remains disturbingly constant. The Arab League formed in 1945 to prevent the emergence of Israel, launching the most lop-sided war in human history, a war that continues hot and cold to the present day, pitting multiple non- and anti-democratic regimes against the Jewish State. . . . Moreover, the war against Israel required the sacrifice of hundreds of thousands of Palestinian Arabs to permanent refugee status, lest their productive redeployment mean (as Cairo radio put it in 1957) “the final disposal of a moral asset.” The Arab world fueled its war against Israel with the permanent misery of Palestinian Arabs -- and ascribed that misery to the “oppressor Jews” in a more perfect moral inversion than any literary Satan ever proposed. . . .
Look again at the full-scale map. Keep it always within reach and often within sight. Don’t let any course or discussion of the Middle East proceed except in its presence. And if the need arises, ask why Arabs and Muslims think they deserve odds greater than 640:1.